In 1821, the area that would become Tucker was in Militia District 572 in Henry County. The state created DeKalb County on December 9, 1822, and District 572 became DeKalb's 18th District, or the Brownings District, reportedly named for Andrew Browning. In spite of DeKalb County delegates voting against secession from the United States, Georgia joined the Confederacy and seceded from the union in 1861. The full reality of that decision marched into Tucker in July 1864. Union soldiers camped at Henderson's Mill, used the Brownings Court, one of the few buildings in the area they did not burn, dismantled the railroad to Stone Mountain, and formed the left wing of Sherman's advance to Atlanta. In 1886 the Georgia, Carolina and Northern Railway received a charter to build a new rail line between Monroe, North Carolina, and Atlanta. Prior to the project's completion, the company leased the road to the Seaboard Air Line Railroad system, a collection of regional railroads headquartered in North Carolina eager to extend its reach to Atlanta. Seaboard built depots at a number of small villages, often little more than a crossroads, and named them for railroad company officials. The depot at Jug Tavern, for example, was named for Seaboard's general manager, John H. Winder. The stop at Bryan was named in honor of the system's general superintendent, Lilburn Meyers. Although the origin of the name is unknown, it is possible that the next stop, in the Brownings District, may have been named for Rufus S. Tucker, a director and major shareholder in several Seaboard system railroads. At the DeKalb County Centennial Celebration in 1922, Charles Murphey Candler stated that Tucker a “prosperous and promising village on the Seaboard Air Line Railway . . . was named in honor of Capt. Tucker, an official of the Seaboard Air Railway.” Some residents attribute the name to a local family with the surname Tucker. 1895 Map of DeKalb County, Georgia, including Tucker. Tucker is located in northeastern DeKalb County at 33°51′6″N 84°13′17″W﻿ / ﻿33.85167°N 84.22139°W﻿ / 33.85167; -84.22139 (33.851736, -84.221524), approximately 15 miles (24 km) northeast of downtown Atlanta. According to the United States Census Bureau, the CDP has a total area of 12.1 square miles (31 km2), of which 12.0 square miles (31 km2) is land and 0.1 square miles (0.26 km2), or 0.83%, is water. Tucker is in the state's Piedmont geologic region, composed of igneous and metamorphic rocks resulting from 300 to 600 million year old sediments that were subjected to high temperatures and pressures and re-exposed roughly 250 to 300 million years ago. Rocks typical of the region include schist, amphibolite, gneiss, migmatite, and granite. Tucker's climate, typical of a humid subtropical climate, features mild winters and hot summers. In spite of moderate conditions compared to communities in many other states, Tucker has occasional extreme weather. The record high is 110 °F (43 °C), recorded on July 8, 1927, and the record low, January 21, 1985, −10 °F (−23 °C). Tucker Football League (TFL) and Triumph Youth Soccer Association (TYSA), formerly the Tucker Youth Soccer Association, are the two largest independent youth sports organizations in the community. TYSA is the largest in DeKalb County, and the fourth largest youth soccer association in Georgia. The TFL holds games and practices at the privately owned Fitzgerald Field. TYSA uses county fields at Henderson Park and the privately owned Granite – Patillo Field. Adult sports include road bicycle racing. The weekly 42-mile (68 km) Tucker Ride and Baby Tucker. According to Southeastern Cycling, "This is where the big boys and racers show up to play." The Tucker ride maintains speeds over 24-mile (39 km) per hour. The Baby Tucker is slightly less strenuous at 20-mile (32 km) per hour. Tucker serves as corporate headquarters for several nationally recognized companies including; Oglethorpe Power, YP Holdings (Publisher of ‘’The Real Yellow Pages’’), Primo Grills and Smokers, and Inland Seafood. Tucker is also home of the U.S. Poultry & Egg Association the Emory University Orthopaedics and Spine Hospital, the Montreal Industrial district, a portion of the Northlake retail area, and Royal Atlanta Business Park. Just Bakery of Atlanta also has a storefront in Tucker. In February 2013, DeKalb County Board of Commissioners approved the formation of the Tucker Community Improvement District (CID). In August 2014 the Tucker CID changed its name to Tucker-Northlake CID to reflect expansion into the Northlake business district. Tucker is also home to the Stone Mountain CID along Mountain Industrial Boulevard. Tucker is in Georgia's 4th and 6th Congressional Districts; Georgia State Senate Districts 40 and 41; and Georgia House of Representatives House Districts 81, 86, 87, and 88. Tucker is in DeKalb County Commission Districts 1 and 4 and Super Commission District 7. In the Tucker CDP, 91.4% of adults have graduated high school, 7% higher than the state average, and 46.8% of adults age 25 or older have a bachelor's degree or higher, 19% higher than the state average. Tucker owes the origins of its infrastructure in large measure to the efforts of former DeKalb County Commissioner, Scott Candler Sr. In the 1940s and 50s Candler brought resources typically reserved for cities to rural communities. Road improvements, public safety, water, and library resources were pushed to the far ends of the County under his administration. Tucker residents continued the tradition of expansion by maintaining and improving these resources throughout the 1960s, 70s, and 80s. Local businesses like Cofer Brothers, a lumber and supply company, thrived under the mid-century housing boom. DeKalb County continues to acquire green space in Tucker, invest in road improvement projects, and work with local committees and organizations to improve the area. In 2000, the Tucker Civic Association adopted a Neighborhood Strategic Plan created to assist in identifying goals and policies from the 1996 DeKalb County Comprehensive Land Use Plan, and to make recommendations for strategic planning and development of the Tucker neighborhood identity. In 2005, the Atlanta Regional Commission issued Tucker a grant for the development of a Livable Cities Initiative (LCI). The LCI study focused to reestablishing Main Street as a central point for the greater Tucker community, create a more pedestrian-friendly and interconnected town center by encouraging walking and other modes of transportation to and around the commercial core. In 2008 the DeKalb County Board of Commissioners approved the Tucker Overlay District enabling local business to improve the downtown area. In 2006 the DeKalb County Police Department headquarters relocated to Tucker off Northlake Parkway. The Tucker Precinct is location next to the Cofer Crossing Shopping Center. Tucker is also home to DeKalb County Fire and Rescue Department's Station 5 on Lawrenceville Hwy, and Station 22 on Montreal Road. The portion of Tucker in Gwinnett County is services by Gwinnett Police Department, North and South Precincts, and by Gwinnett County Fire Department Station 2 on Harmony Grove Road. The Tucker zip code is home to over 230 acres (93 ha) of DeKalb County parks and recreation areas including lakes, creeks, trails, tennis courts, baseball and soccer fields, a swimming pool, and playgrounds. The DeKalb County Public Library operates two branches in Tucker. The Tucker-Reid H. Cofer Library, and the Northlake-Barbara Loar Library. The Tucker-Reid H. Cofer area branch open on Church Street in 1965. In 2010, the library moved to a 25,000 square foot facility at the intersection of LaVista Road and Lawrenceville Highway. The new facility received LEED Gold Certification from the U.S. Green Building Council. In 1991, the county built a second library on LaVista Road in Tucker, the Northlake Barbara-Loar community branch, approximately 3.4 miles west of the Tucker-Reid H. Cofer branch. In 2009, the library expanded from 10,000 square feet to 15,000 square feet. ^ "Tucker elects its first mayor and city council". March 2, 2016. ^ "Annual Estimates of the Resident Population: April 1, 2010 to July 1, 2016". U.S. Census Bureau, American Factfinder. Retrieved May 26, 2017. ^ a b Mark Niesse (November 3, 2015). "Voters approve city of Tucker, reject LaVista Hills". The Atlanta Journal-Constitution. Retrieved April 29, 2016. ^ "Election Summary Report DeKalb County State of Georgia General Municipal and Special Election November 3, 2015 Summary For Jurisdiction Wide, Multiple Counters, County Final and Complete" (PDF). DeKalb County. November 9, 2015. Retrieved April 29, 2016. ^ "Election Summary Report DeKalb County State of Georgia General Municipal and Special Election March 1, 2016 Summary For Jurisdiction Wide, Multiple Counters, County Final and Complete" (PDF). DeKalb County. March 6, 2015. Retrieved April 29, 2016. ^ Lucas, Silas Emmett Jr. (1986). The Fourth or 1821 Land Lottery of Georgia. Southern Historical Press, Inc. p. i. ^ Bryant, Pat; Shields, Ingrid (1983). Georgia Counties: Their Changing Boundaries. Georgia Department of Archives and History, a Division of the Office of Secretary of State Max Cleland. pp. 50, 62, 67. ^ Timmons, Elias W. (Tim) (2013). A History of Tucker 1821-1942. Tucker Historical Society. p. 19. ^ Brooke, Ted O. (2012). Cemetery Record of Tucker, Georgia and Environs (DeKalb and Gwinnett Counties). The R. J. Taylor, Jr., Foundation. pp. 189–190. ^ "Second Annual Report of the Board of Railroad Commissioners of North Carolina, for the Year Ending December 31, 1892". Railroad Commission of North Carolina. 1893. p. 220. Retrieved January 21, 2014. ^ Candler, Charles Murphey (1922). DeKalb County Centennial Celebration at Decatur, Georgia November 9, 1922 Historical Address by Hon. Charles Murphey Candler. DeKalb County Centennial Association. p. 21. ^ Timmons, Elias W. (Tim) (2013). A History of Tucker 1821-1942. Tucker Historical Society. p. 98. ^ "Second Annual Report of the Board of Railroad Commissioners of North Carolina, for the Year Ending December 31, 1892". Railroad Commission of North Carolina. 1893. p. 224. Retrieved January 21, 2014. ^ "Postmaster Finder Postmasters by City, Tucker Post Office, DeKalb County, Georgia". United States Postal Service. Retrieved February 10, 2014. ^ "First Rural Routes by State" (PDF). United States Postal Service. April 2008. Retrieved February 17, 2014. ^ Griffin, William (2004). Seaboard Coast Line & Family Lines. TLC Publishing. pp. 4–16. ISBN 0-9766201-0-3. ^ "CSX Transportation 4312 Railroad Ave, Tucker, GA 30084". Retrieved January 21, 2014. ^ Brooke, Ted O. (2012). Cemetery Record of Tucker, Georgia and Environs (DeKalb and Gwinnett Counties). The R. J. Taylor, Jr., Foundation. p. vii. ^ Shelton, Morris (1971). Mr. DeKalb. Dixon's Inc. pp. 49–50. ^ Turner, Dewey (2009). From Cotton Fields to High Technology in Tucker, Georgia (Reprint ed.). Tucker Historical Society. p. 80. ^ "National Hydrography Dataset watershed boundary data". U.S. Geological Survey. Archived from the original on April 5, 2012. Retrieved January 22, 2014. ^ Timmons, Elias W. (Tim) (2013). A History of Tucker 1821-1942. Tucker Historical Society. pp. 22–27. ^ a b "Tucker, Georgia Average Temperature". weatherdb.com. Retrieved January 21, 2014. ^ "Tucker, Georgia Average Rainfall". weatherdb.com. Retrieved January 21, 2014. ^ a b "State & County QuickFacts, Tucker CDP, Georgia". U.S. Census Bureau. January 7, 2014. Retrieved January 24, 2014. ^ "Our Story". Rehoboth Baptist Church. Retrieved February 5, 2014. ^ "Who We Are". First Baptist of Tucker. Retrieved February 5, 2014. ^ Brett, Dena (January 21, 2012). "'Cleave unto charity': Serving others at bishops' storehouse in Georgia". Deseret News. Retrieved February 5, 2014. ^ "Questions: What makes the TFL different from other leagues?". Tucker Football League. Retrieved February 6, 2014. ^ "Directions to Fields". Triumph Youth Soccer Association. Retrieved February 6, 2014. ^ Trish Albert. "Atlanta Group Road Rides". Southeastern Cycling. Retrieved January 23, 2014. ^ "Tucker Ride". Mapmyride.com. Retrieved January 23, 2014. ^ "State & County QuickFacts, Tucker CDP, Georgia". U.S. Census Bureau: State and County QuickFacts. January 7, 2014. Retrieved January 24, 2014. ^ "Tucker Northlake CID". Tucker-Northlake Community Improvement District. Retrieved April 30, 2016. ^ "Tucker CID Changes its Name to Tucker-Northlake CID to Reflect Expansion, Inclusion and Cooperation". Tucker-Northlake Community Improvement District. August 7, 2014. Retrieved April 30, 2016. ^ "Stone Mountain CID". Stone Mountain Community Improvement District. Retrieved April 30, 2016. ^ "District 40". State of Georgia. Retrieved January 31, 2014. ^ "District 41". State of Georgia. Retrieved January 31, 2014. ^ "Commissioner Districts" (PDF). DeKalb County Georgia. September 4, 2015. Retrieved April 30, 2016. ^ "Super Commission Districts" (PDF). DeKalb County Georgia. September 4, 2015. Retrieved April 30, 2016. 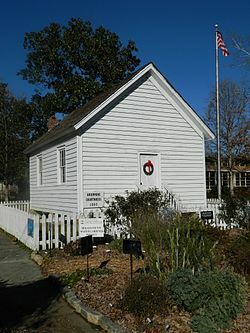 ^ "State & County QuickFacts, Tucker CDP, Georgia". U.S. Census Bureau. January 7, 2014. Retrieved January 24, 2014. ^ "Sam A. Moss Service Center 1780 Montreal Road Tucker, GA 30084". Retrieved January 17, 2014. ^ Shelton, Morris (1971). Mr. DeKalb. Dixon's Inc.
^ "Program Underway, Twin Brothers Lakes acquisition". DeKalb County Georgia. Retrieved April 30, 2016. ^ "Tucker – a Lifelong Communities Case Study" (PDF). Atlanta Regional Commission. May 22, 2012. Retrieved January 21, 2014. ^ "Tucker Lifelong Community". Atlanta Regional Commission. Retrieved January 21, 2014. ^ "DeKalb County Board of Commissioners Zoning Agenda/Minutes" (PDF). DeKalb County Board of Commissioners. March 25, 2008. Retrieved January 21, 2014. ^ Atlanta Regional Commission Staff (February 2008). "Downtown Tucker Overlay Ordinance". Atlanta Regional Commission. Retrieved January 21, 2014. ^ "Tucker Precinct". DeKalb County Georgia. Retrieved January 21, 2014. ^ a b "Fire Station 22". DeKalb County Georgia. Retrieved January 21, 2014. ^ "Fire Station 5". DeKalb County Georgia. Retrieved January 21, 2014. ^ "Police Precincts". Gwinnett County Police Department Department. Retrieved January 29, 2014. ^ "Fire Station 2". Gwinnett County Fire Department. Retrieved January 29, 2014. ^ "Park Maps, Tucker". DeKalb County Recreation, Parks & Cultural Affairs. Retrieved January 22, 2014. ^ Pam McNall (November 23, 2012). "Historic Johns Homestead Gets Some Attention". Tucker Patch. Retrieved January 22, 2014. ^ Scott Bernarde (December 9, 2013). "Hike a Trail at Tucker Nature Preserve Holiday Open House". Tucker Patch. Retrieved January 22, 2014. ^ "Tucker-Reid H. Cofer Library". Retrieved January 17, 2014. ^ "Northlake-Barbara Loar Library". Retrieved January 17, 2014. ^ "Tucker-Reid H. Cofer Branch Library: Tucker, GA". Hogan Construction Group. February 15, 2012. Retrieved January 22, 2014. ^ "Northlake Barbara-Loar Library: Tucker, GA". Hogan Construction Group. February 15, 2012. Retrieved January 22, 2014.